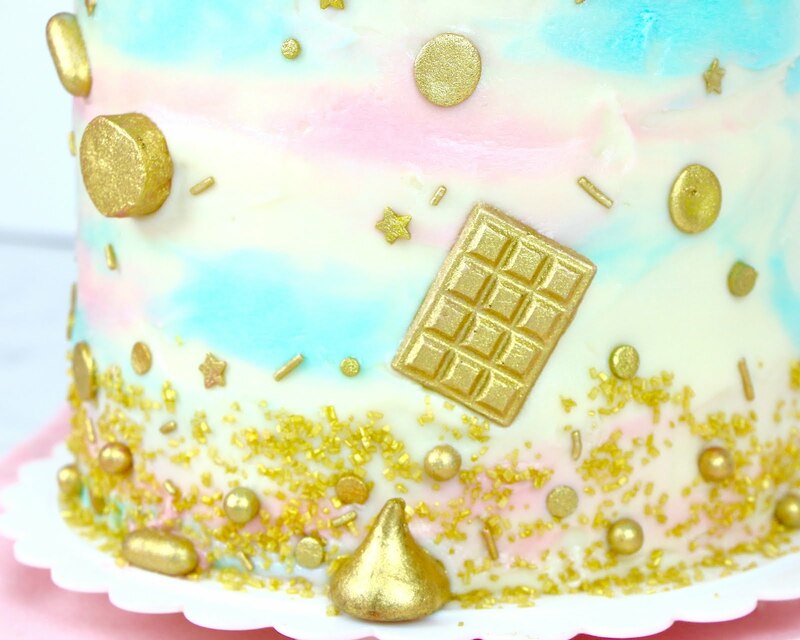 Today I announced weather I'm pregnant with a boy or a girl, with my no-bake gender reveal cake!... and it's a GIRL! This is our first baby and I couldn't wait to let you guys know what we're having. 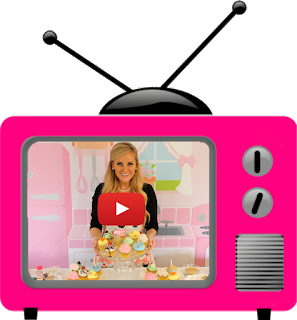 It's been a long journey for us- check out my pregnancy announcement video for our full story, if you haven't seen that video, for all the details of what we've been through to get to this point. 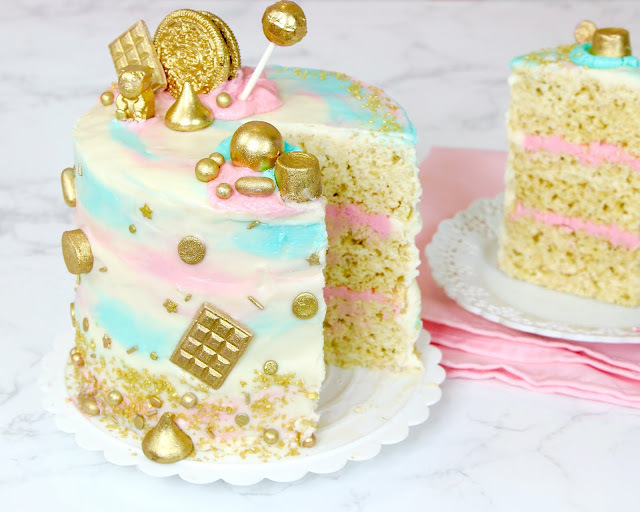 Since I'm already in my third trimester, I opted to do this really easy no-bake cake, that you don't even need the oven for, because at this point, I'm not trying to be slaving away all day in the kitchen for anyone. So this fun cake is made out of marshmallow cereal treats, because my husband doesn't love cake but he totally loves rice krispies treats and it's so easy to make, so win win and I think you're gonna love it. 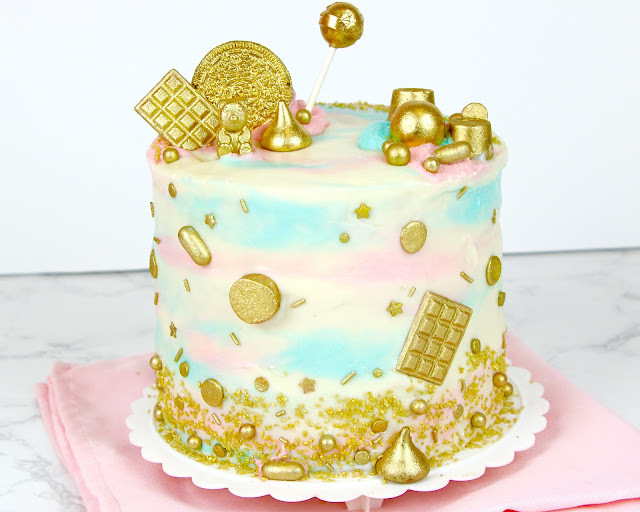 I created a watercolor effect with the frosting and added edible gold painted candy and sprinkles to decorate! 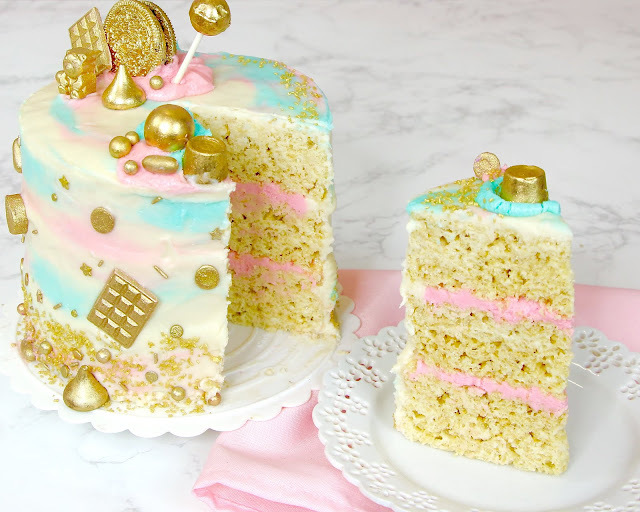 The best part is, this cake is so easy to serve, you don't even really need a fork... Also, rice krispies treats are sooo good with frosting on top, if you've never tried it before! 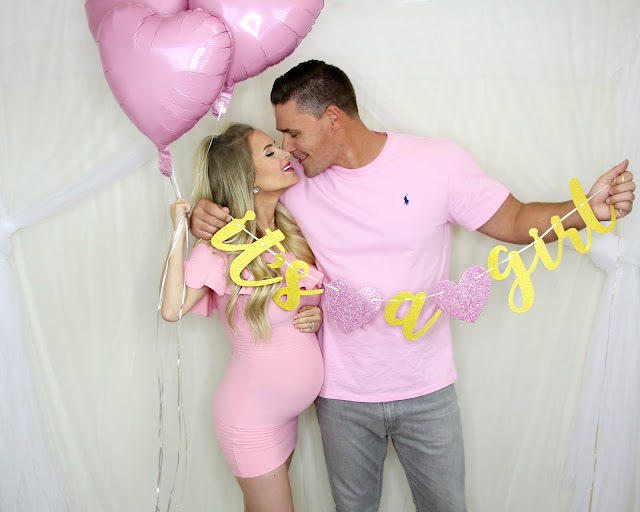 If you guys give this a try, make sure to go follow me on social media @TheLindsayAnn and tag me in a picture, so I can go like all of your recreations, or share this video with somebody who you know would love this gender reveal idea! Line three 6-inch round cake pans with plastic wrap and spray with non-stick cooking spray. 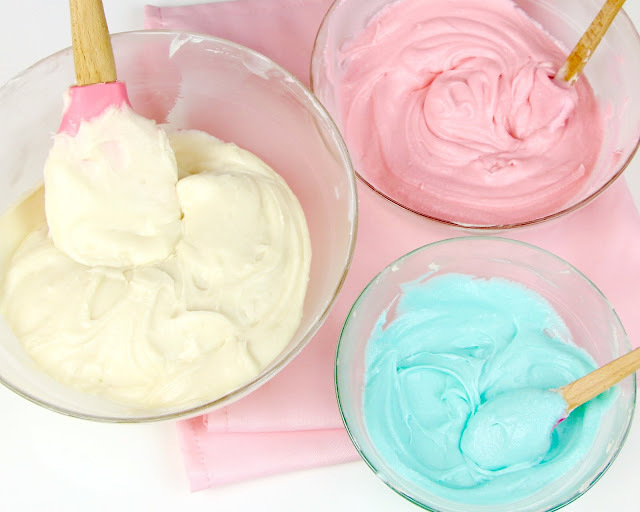 Melt butter in a large saucepan and stir in marshmallows over low heat, stirring until just melted (Or melt butter and marshmallows in a microwave-safe bowl, on HIGH for 3-4 minutes, stirring after 2 minutes. Remove from heat and stir in vanilla and salt. Pour over cereal in a large mixing bowl, mixing gently until cereal is well coated. Divide mixture between prepared pans. Press down with greased hands until flat and level, making sure the mixture is pressed into the corners of the pan. Place in fridge to cool until set, about 30 minutes. Mix together a few drops of vanilla extract and edible gold lustre dust to form a paint. 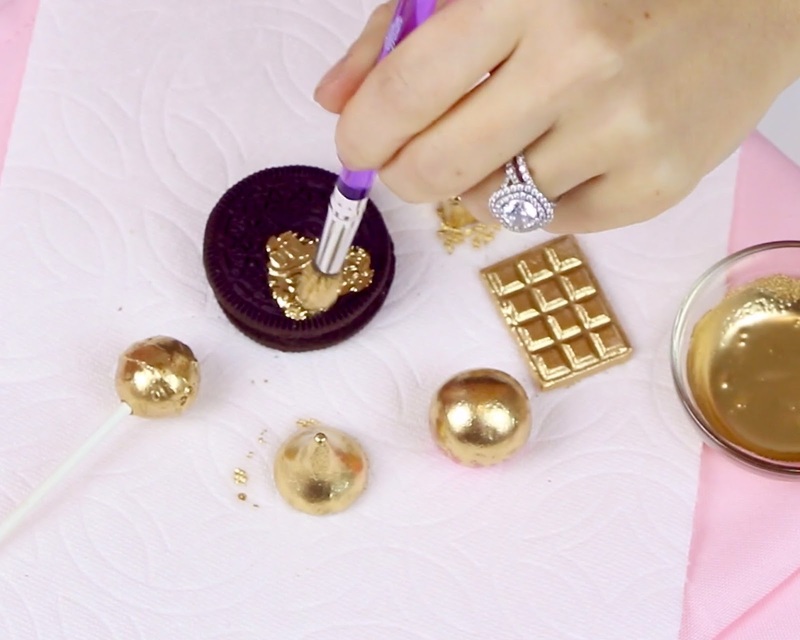 Brush onto candies and sprinkles, until fully covered in gold. Let dry on a paper towel. With an electric mixer, beat the softened butter on medium-high speed until light and creamy, about 2-3 minutes. Beat in vanilla and salt. Add the powdered sugar, 1 cup at a time, starting on on low and increasing to medium, until fully incorporated, scraping down sides and bottom of bowl as needed. Add cream, a few tablespoons at a time, until desired consistency is reached. Scrape down bottom and sides of bowl. Increase to medium-high speed and beat for an additional 3-5 minutes until smooth, light and fluffy. 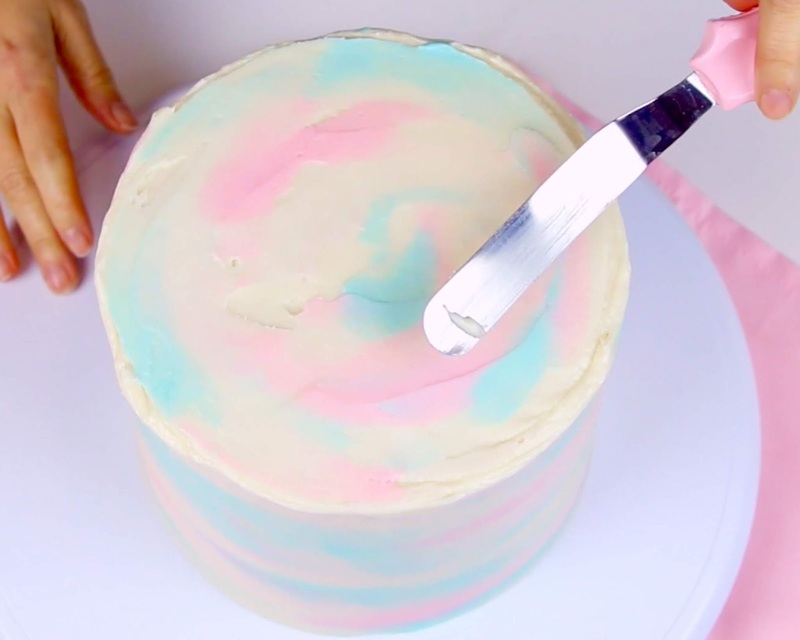 Split frosting in half, keeping one half of frosting white, for frosting the outside of the cake. Using pink and blue food coloring, dye 1/3 of the remaining half of frosting opposite of what the gender is, for decoration on the outside. 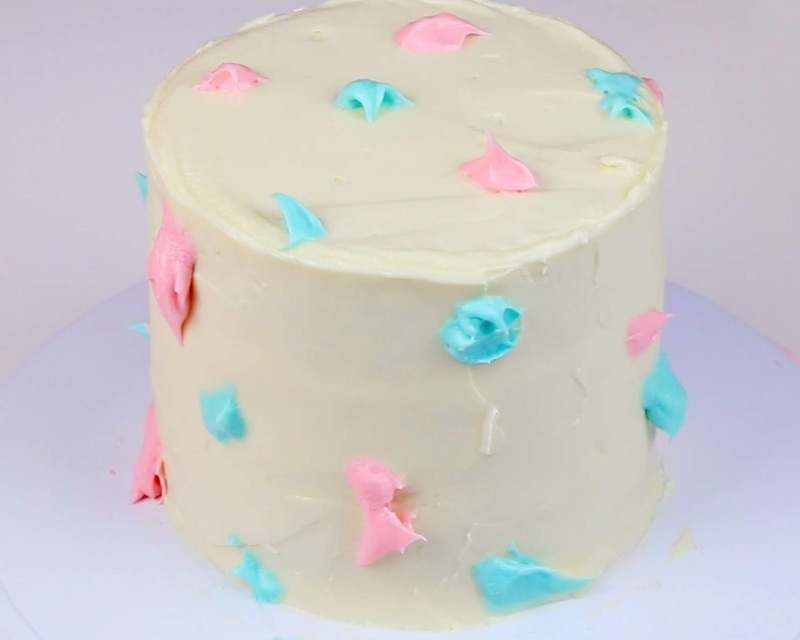 Dye the last 2/3 of frosting the color of the gender reveal, for the surprise filling on the inside and decoration on the outside. 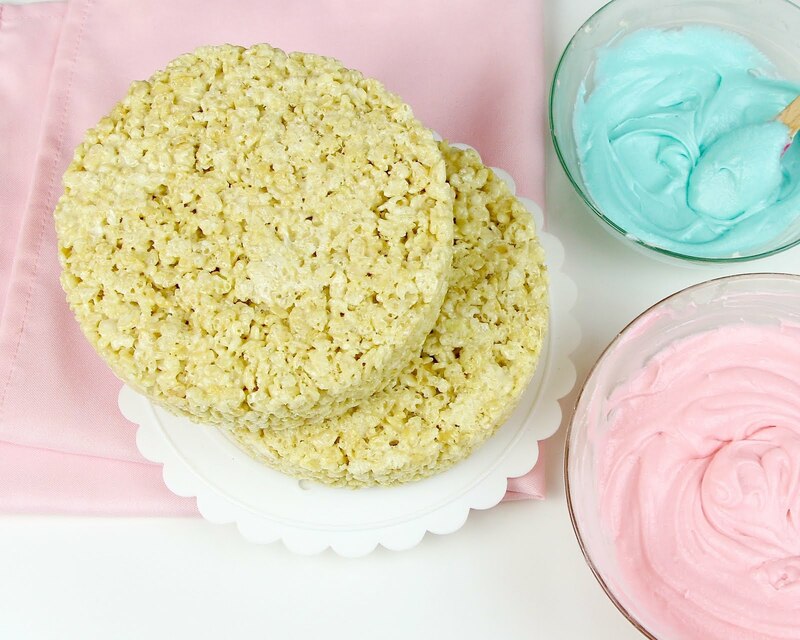 Place 1 krispies treat layer on a plate or cake stand. 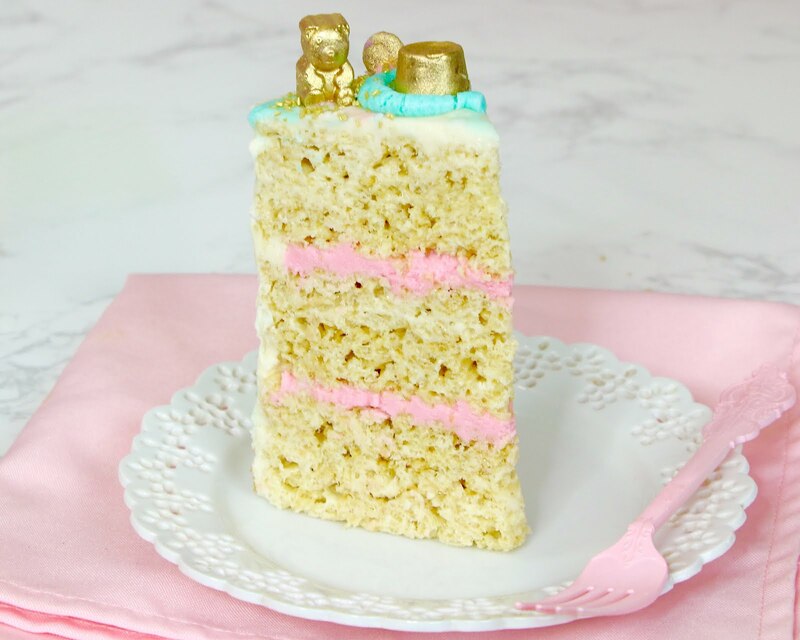 Spread a layer of filling on top (the color of the gender reveal) and smooth with an off set spatula or knife. Repeat with the second layer, saving some for decoration on the outside. Position the third layer, flat side up, on top, unfrosted. Frost the top and sides of the cake with the white frosting. 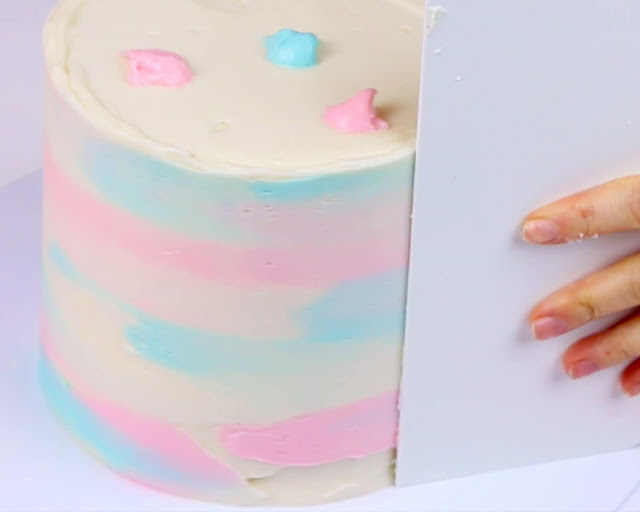 Add small, random dots of pink and blue frosting around the cake and use a cake spatula or bench scraper to smooth, creating a blended effect. 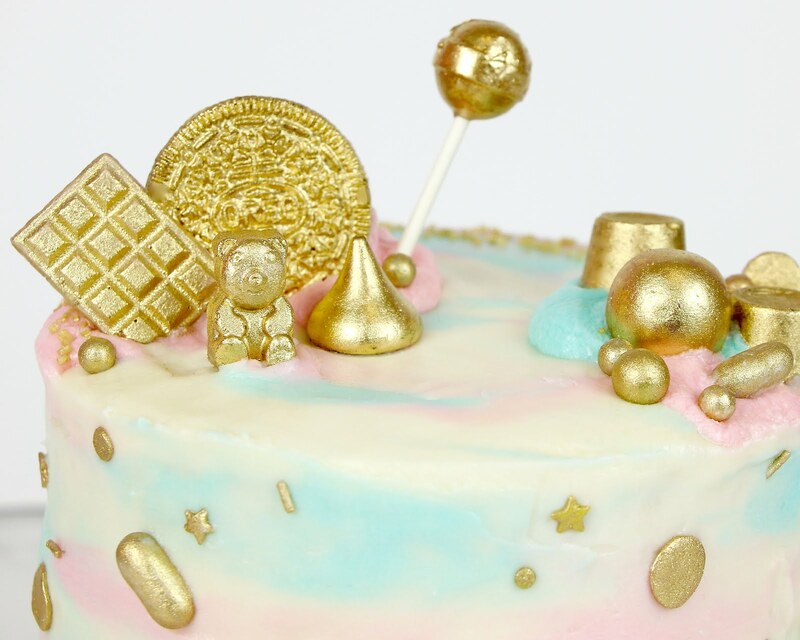 Immediately add sprinkles and candy to decorate. Note: This is best made and served the same day, but will store in an air tight container at room temperature for up to 2-3 days.